Recently, I travelled to Green Shoes in Moretonhampstead, Devon for a shoe making course. As I’ve told you before, I’ve always loved fashion and textiles, and one of my dreams as a young girl was to be a fashion designer. Growing up, I had sketchbooks filled with clothing and accessory designs that I couldn’t wait to bring into reality. All I ever thought about was clothes and how I could make them myself. I was well and truly obsessed. Fashion was definitely my first love, and something I know I’ll always be passionate about. However, over time I moved away from the thought of it as a career. I knew at some point I would return to it, but I just wasn’t sure when. I still enjoyed fashion, but my interest in it transformed into a hobby. I had different things to focus on, and fashion became my release from my day-to-day life. I was inspired by the changing trends, evolving of peoples style and use of fashion as a self expression. I noticed fashions change, as I changed as a person. As time since passed, I found myself longing to return to the physical, making, aspect of fashion again. A few months ago, I decided I was going to leave my career path open, stop worrying about the future and try lots of new things. It was time for me to get back into fashion. I broke my interest down into three main sections; clothes, shoes and bags, and began looking for courses in the subject. Firstly, I decided to learn about shoes. After some googling, I discovered lots of classes and short courses I could take. I was so amazed by all of the opportunities available, but the course that stood out the most for me was the one run by Green Shoes. As I visited their website, I discovered that on their courses, you could learn how to make shoes with a material called Lorica. This material is made to look like leather or suede, but it is not derived from an animal. After I read this, I was so intrigued by it that I knew I had to take their course. When I started my blog, I wanted to make food and recipes that would enable me to rely less on animal products. Doing so encouraged me to become a more creative cook, using alternative, plant based ingredients. And, it also encouraged me to rely less on animal products in other aspects of my life too. So, when I saw that there was the option to make shoes from this material, I couldn’t wait to learn more about it. When the day came for me to take the course, I was so excited. 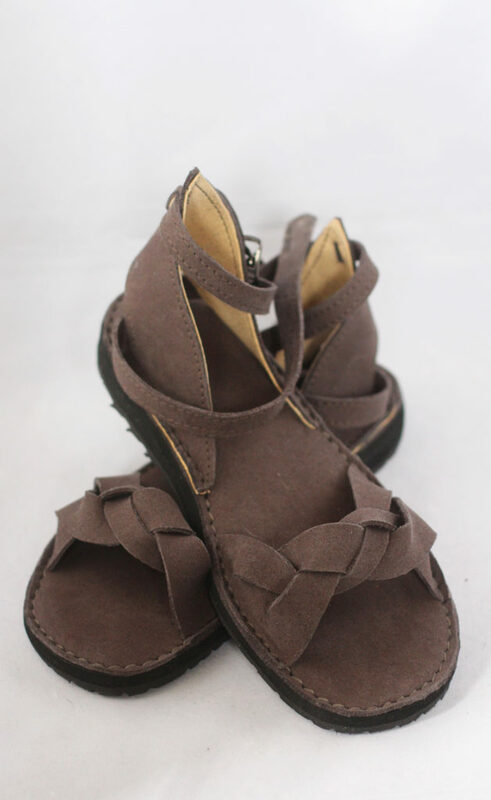 When I arrived at Green Shoes, I chose to make a pair of sandals for my upcoming trip to India. 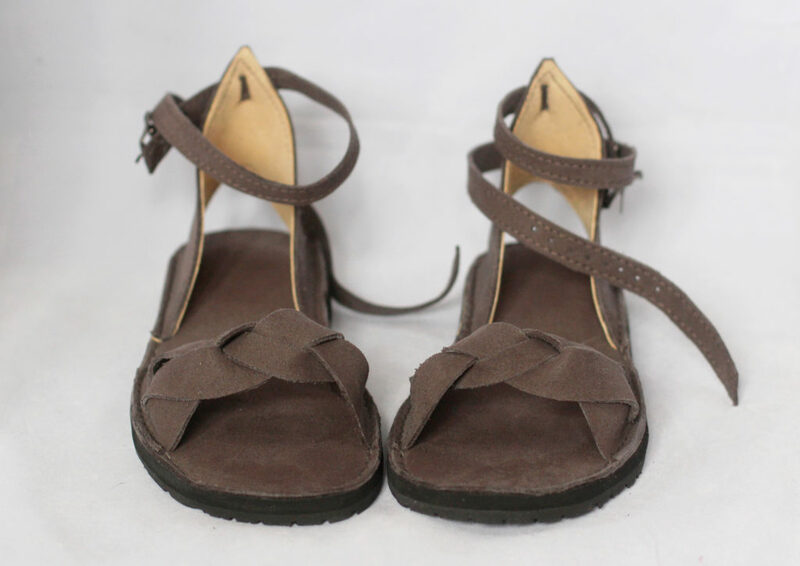 I decided to make them with dark grey Lorica Suede, as I loved it’s beautiful colour and its soft, smooth feeling. Next came the making process. Following templates, I cut out the shapes for my shoes, and stitched the parts together using a sewing machine with help from shoemaker, Emily. Then, I placed glue onto the shapes, ready for Alison, the owner of Green Shoes to secure and sew everything together to finish them. The entire shoemaking process was so much fun, and I was so happy to see them when they were finished. I loved the final result, and was amazed by just how comfortable they are. I can’t wait to wear them on my holiday now! Taking the class really enabled me to rediscover my interest in textile design. I already have so many ideas for the other designs I want to make next. I can see myself now, making all sorts of shoes with different patterns, colours, and embellishing them with different studs, brooches and buttons! Wow this is so cool! I’d love to create my own pair of green shoes. I was reading that some of the leather products we buy might contain skin from animals other than cows, such as dogs. I already eat a mainly vegetarian / vegan diet, but I want to make the switch and use less animal products too. Love this idea! Thank you! Hehe that would be amazing! Such a cool class and your shoes look gorgeous! Way to go pursuing every avenue, Harriet! Glad to know they are comfortable too! OMG! These shoes look stunning, Harriet. Glad to know they are so comfy. That class was so much fun I must say! Thank you so much Hannah! It was such a fun course! Wow, these are amazing. They look so professional too. You are going to India? I can’t wait to hear all about your trip. the shoes look so comfortable! that is so awesome that you get to make your own pair of shoes!